Government plans to reduce greenhouse gas emissions still fall far short of those needed to avoid runaway global climate warming, according to a new study from the International Renewable Energy Agency (IRENA). The cumulative amount of energy-related emissions will exceed the global carbon budget required to limit global warming below the posited climate change tipping point of 2°C by 2037, IRENA asserts in “Global Energy Transformation: A Roadmap to 2050.” Emissions will need to be reduced a sum total of 470 billion metric tons (Gt) by 2050 to limit the mean, global temperature rise to 2°C. IRENA’s report isn’t all bad news. To the contrary, the combination of already available, cost-effective renewable energy technologies and energy efficiency improvements can get us 90 percent of the way there. Moreover, achieving the targets IRENA sets out would boost global GDP and employment above that forecast under current economic policies, conditions and nationally determined contributions to global emissions reductions pledged as part of the 2015 UN Framework Convention on Climate Change (UNFCCC) Paris Climate Agreement. 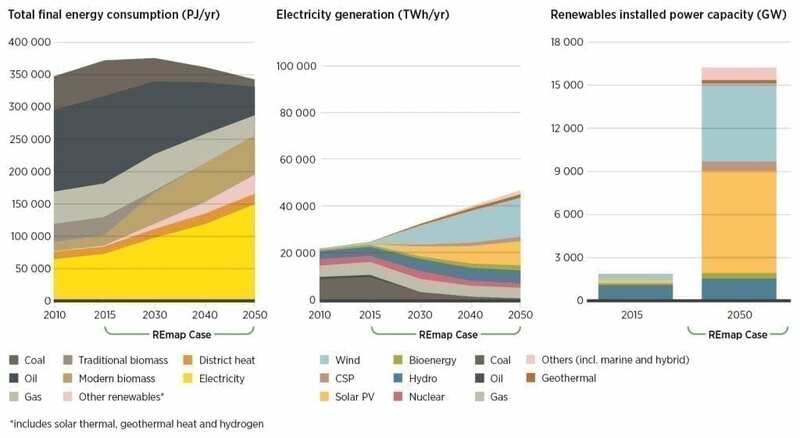 Under its base case, “business as usual,” scenario, IRENA forecasts energy-related CO2 emissions will increase slightly year-over-year out to 2040, then drop slightly by 2050 to hold steady around today’s levels, which exceed 400 parts per million (PPM). 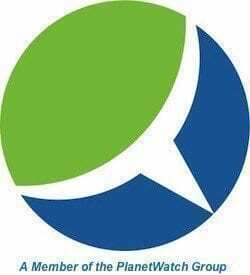 Accelerating deployment of emissions-free, renewable energy resources 1.4 percent per year along with electrification – conversion of energy use in the built environment, transportation and industry – would achieve 75 percent of Paris Climate Agreement, 2050 emissions reductions targets. That equates to a six-fold increase in renewable energy’s share of total final energy consumption (TFEC). 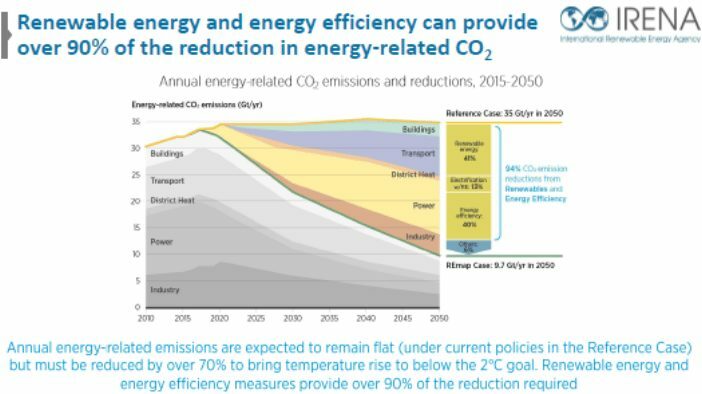 Energy efficiency improvements would add 15 percent, bringing the world community 90 percent of the way to limiting the forecast rise in global mean temperature below 2°C (1.8°F), according to IRENA. Transforming production, distribution, and use of energy would yield substantial socioeconomic benefits worldwide in addition to potentially avoiding runaway global warming, IRENA says. “An energy supply system based largely on renewable energy would create a world that is both more prosperous and exposed to fewer long-term risks,” according to the report. Global GDP would increase USD 52 trillion (1%) above that forecast in IRENA’s base case, reference scenario from 2018-2050 were these goals achieved, IRENA determined. In addition, employment would increase 0.14 percent and human welfare would increase 15 percent above the base case, reference scenario level. Realizing the greatest amount of socioeconomic benefits from the energy transformation requires increasing ambition (i.e. 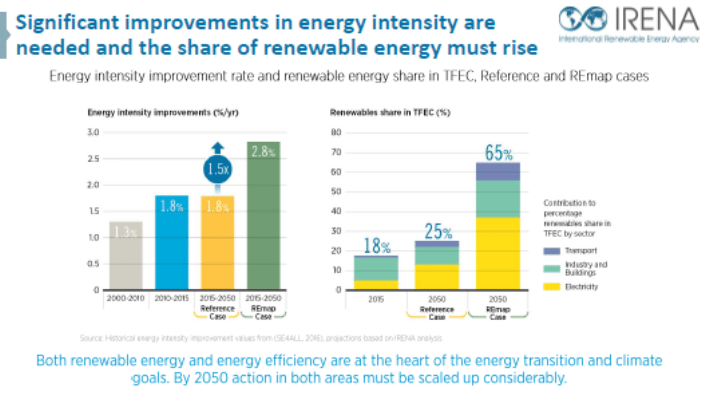 higher renewable energy, energy efficiency and emissions reductions targets), taking explicit account of currently unaccounted for climate externalities (via carbon taxes and the phasing out of fossil fuel subsidies, for example) and fostering development of diversified, domestic supply chains, according to IRENA. Encouragingly, IRENA points out that the cost of renewable energy continues to fall sharply. Record amounts of renewable power generation were installed worldwide this past year and the year-to-year margin above that for new fossil fuel generation continues to widen, for example. In addition, record-low prices for new wind and solar power generation have been set in national auctions recently. Solar PV costs are forecast to drop by half again by 2020 as compared to 2015-2016. Converting energy use in transport, buildings and industry from fossil fuels to electricity from renewable energy resources needs to accelerate significantly, however, IRENA highlights. According to the report, the energy intensity of the global economy needs to drop by around two-thirds by 2050 and fossil fuel use would have to drop to one-third of today’s levels. More broadly, renewable energy’s share of global total final energy consumption needs to rise from 15 percent in 2015 to around 66 percent by 2050.